When it comes to online shopping, Cyber Monday is king. Market tracker Adobe Analytics predicts online retailers will see $7.8 billion in sales this Monday, making it America's single largest online shopping day -- eclipsing Black Friday ($6.22 billion in estimated online sales) and Thanksgiving (some $3.3 billion in sales). And that's just the beginning for online retailers. Adobe projects that total online sales will reach $124.1 billion this holiday season, with 36 days in November and October topping $2 billion in sales each. Industry experts expect a strong economy and high consumer confidence to mean a healthy haul for e-retailers of many different stripes. Deloitte projects a 17% to 22% increase in e-commerce sales compared with the 2017 holiday season, which totaled $109.9 billion in online sales. Purchases made via mobile devices will drive a large part of the growth, according to App Annie, a global provider of mobile data and insights. The firm expects e-tailers to offer mobile promotions earlier. "We predict Thanksgiving Day -- compared to Black Friday and Cyber Monday -- will see the the largest growth in time spent in shopping apps this year in the United States, at 30% growth year over year among the top 150 shopping apps on Android phone," said Lexi Sydow, App Annie's senior markets-insight analyst. 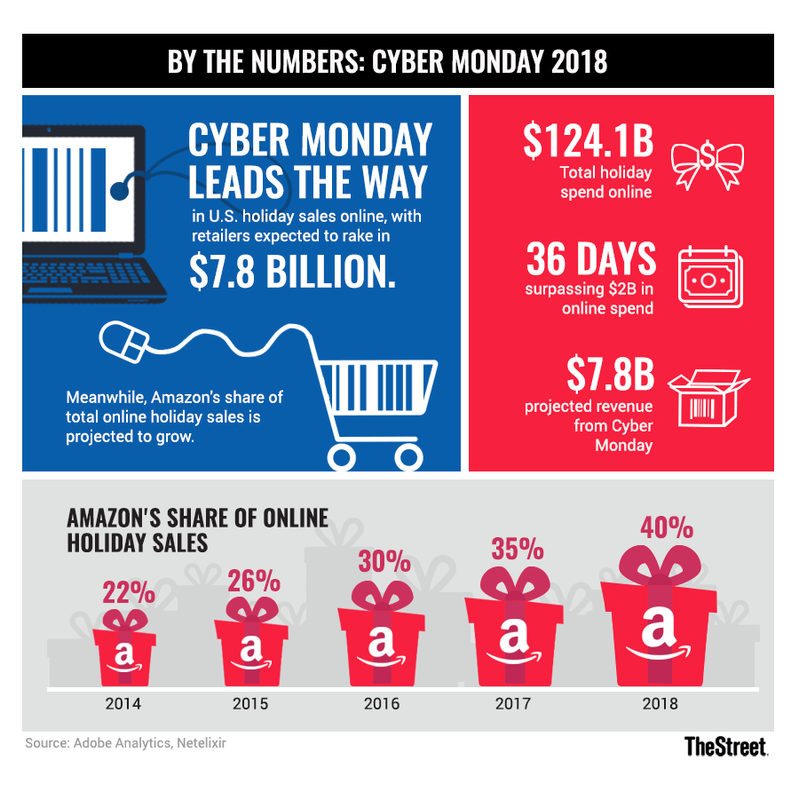 That could bode well for Amazon (AMZN - Get Report) , which captured about one-third of all online sales on last year's Cyber Monday. The search marketing firm Netelixir projects that Amazon will capture about 40% of total online sales this holiday season, up from about 35% last year. Market-intelligence firm Hitwise estimated that Amazon captured nearly 60% of Cyber Monday transactions last year among the top 50 retailers. Walmart (WMT - Get Report) came in a distant second at 8.5% of Cyber Monday transactions, followed by Target (TGT - Get Report) at 4.5%. Results from Cyber Monday could also signal who the big winners will be overall in what's shaping up to be a robust holiday-shopping season. According to Erik Morton of Commercehub, which surveyed 2,000 shoppers on their spending plans, consumers may be more inclined to make decisions based on a retailer's ability to deliver on time, with many expressing that they'd been burned in the past by late deliveries. "We found that 80% of people we surveyed were more confident in shipping and purchasing online," Morton said. "If you're confident that they'll deliver in time, you'll continue to shop throughout the season, and even pull back holiday shopping as close to the holidays as they can do so confidently." Our Own Cyber Monday Sale: Join Jim Cramer's Investors' Club at 66% Off!